Grouper Ruben Sandwich, fries and beer. Not MY lunch but mine was just as fattening. My friends and family know that I have been on a quest to loose extra pounds since my 70th birthday. I anticipated the new wardrobe I would have to buy, but I am not done loosing, yet. Do I buy nice things only to have to give them away when I loose the next size? Or just buy cheap clothing to "see me over" and get the good clothes when I reach my goal. I chose to buy a few better pieces. My son has an acquaintance loosing weight, too, and she is a size bigger so it will all pass down to her IF we both continue toward our goals. Well, to my surprise, there are other strange effects to loosing weight. My shoes are too big. I had to buy new ones half a size smaller and narrow. There are cuter styles in the smaller size. I wonder where this will end? I am cold! The cold in Michigan was not as unbearable to me when I was heavier. This year I kept myself wrapped in an electric afghan covered with a small, fluffy quilt. Even in Florida I have been snugged down in the quilt every time the temperature dips below 50 degrees. I didn't notice the cold as much when I had that layer of insulation I lost this year. Meanwhile, I am struggling to back get on the loosing track, but it is hard with all the wonderful places to eat in Florida. We have company rather often and we want to take them out. Finding appropriate items on the menu is nearly impossible. No, we aren't hearing music from the bird nests on the wildlife preserve island in the middle of our lake. Two years ago I blogged about the wonderful nest an Osprey pair built at the top of the cell phone tower across the bay from the house. 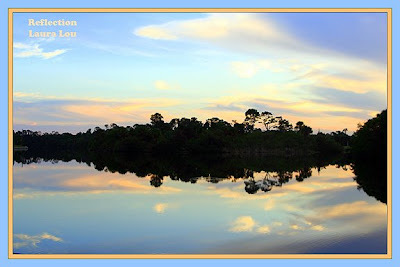 I fantasized about being in that nest and seeing across the Indian River, across the beaches, and to the ocean. Then in 2008, a pair of owls, who nest earlier than the Osprey, grabbed the nest and we watched as they raised two little owlets. Lots of photos, but at that distance, nothing very good...even with a 300mm lens. This year the Osprey are back and in their nest. You can just see the wing at the left of the tower as she settles into her home again. All of this is just amazing to watch. Within a week or so we may start hearing the little Osprey like we did in 2007. I wonder where the owls went. No...that is the other Osprey(on the right) flying in to join his mate at the nest. Brush fires are a real scourge in Florida. Last year we watched as one went out of control in the same place as this one seems to be. The news, however, mentioned several controlled burns conducted by the municipalities, to keep wildfires from starting. Last year was a bad one for fires, with one responsible for a many-car pileup on the Beach Line Highway. Maybe not Adventure in Paradise, but interesting just the same. I have never been in the Rockies, only flown over them a couple of times. After just a week in Florida I flew to Salt Lake City, Utah for a 5-day meeting with Digital Scrapbooking friends. 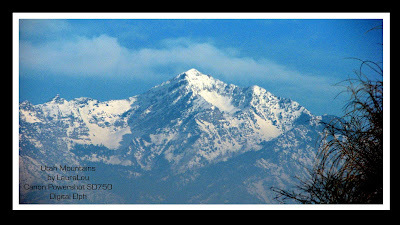 The air quality in the city was really poor, with a brown haze between us and the mountains. A friend who brought her car, took 3 of us up to Park City so we could get up close and personal with the mountains. Most of my photos were taken from the car with my little Canon Digital Elph which has an anti-shake feature. 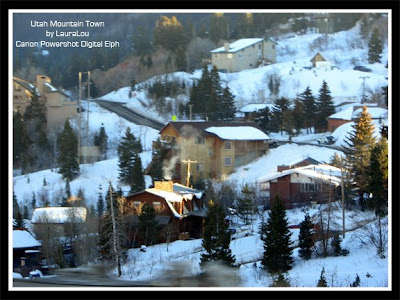 Park City was exciting with the crowds of "beautiful people" (celebrities and no one over 35 years of age) for the Sundance Film Festival. We didn't recognize any of the notables, but we weren't looking. Photos were impossible trying to get down the narrow clogged streets. 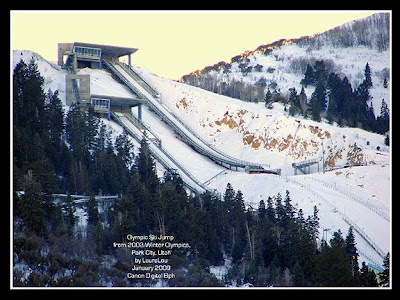 The ski facilities are still operational since the 2002 Olympics. The town itself still shows the paint and "fixing up" that accompanies such a world event. Thank You, JaeDee. for the great tour. Once in a lifetime, for me. It was another cool evening by the lake, after a day of work. There is so much to do when we first get down here. The plants grow non-stop for 8 months, a phenomenon when you are used to plants dying back in winter, or disappearing altogether. Three truckloads of prunings and weeds have gone to the dump already with one more area still to be cut back. Then there is the deck! That was a new task for us; removing black mold or mildew from the textured beige cement of the pool deck/patio. For the last 6 years I have painstakingly power-washed the whole area complaining that I can't do that much longer. It takes two days of inch-by-inch work. This year I talked to someone at Home Depot and discovered Chlorox Outdoor Deck and Patio cleaner. So much better!!! Pour it on, scrub it in with a long handled patio brush, hose it off, and VOILA! Clean! We need to get the third gallon of the stuff and I will be done working only about an hour or two a day. Funny thing, is back home we would probably hire this done. 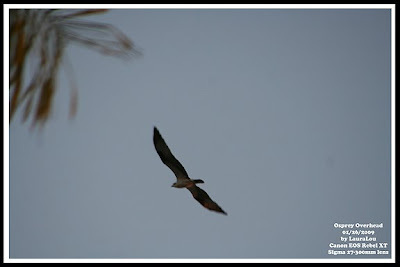 The Osprey we have been watching (or two or four) treated us to a fly-by last evening. He/She circled overhead so close!!! I need my tripod, though. It is hard in the evening to get sharp photos at a distance. We have been concerned about the health of the lake since the algae-bloom killed most of the fish two summers ago. 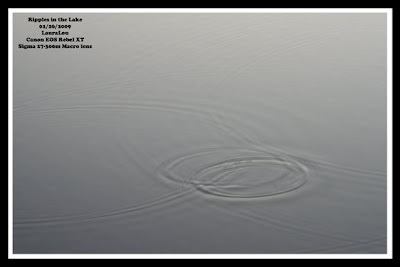 The active ripples of fish and turtles in the evening tell us the lake has come back. 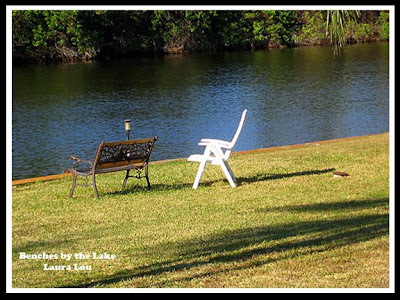 Still no sight of the small alligators we KNOW are there, but that will come with patience. Meanwhile, a fisherman in a boat near our seawall yesterday said he has been taking two-pound bass from the lake this year. I texted the news to my son-in-law who would fish every minute of their 10 days here at Easter. He has taken fish from the lake...NICE ones, but not since the hurricanes and the fish-kill. Maybe this year! This is our place down by the lake. It is just down little hill from the house and gives us a perfect view of the lake with no people around in view, anyway. We go down here at sunset as many nights as we can and sit patiently with a drink and wait to see what the birds and other life have for us. Last year it was the Great Horned Owls who entertained us. Years before that it was watching for alligators. This year, so far, no owls and no alligators. Truly, until Thursday it seemed that we had beat the birds down here. Now that the freezing weather has left (for good, we hope) the birds are back and active. 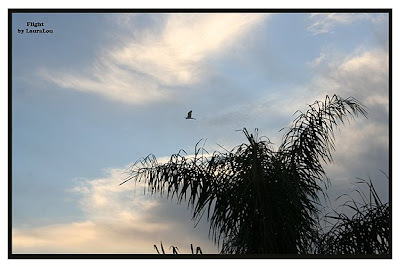 I just liked this photo of a Great Blue flying over one of the palm trees...So Florida!!! This is no trick shot, and I didn't "Photoshop" it..the lake really WAS this calm at sunset last night. How perfect is this? It is still a little chilly after sunset, so shortly after this brilliant display we went inside. We could JUST see the bright red sun through the trees, but not in this picture. ...at least that is what "they" said. I didn't read it for myself. I always wanted a photo of the Full Moon through a palm tree. I used to draw that scene when I was in high school, doodling on my notebook. It was about 6:30 in the evening and the sky was bright blue a few nights before the official Full Moon but the shot was what I wanted. The neighbor said he had seen the moon a few nights before, rising over the Indian River Lagoon between us and the beaches and ocean. So about 6:30 two nights later we drove down to the Rotary Club pier and boardwalk to wait for the moonrise. I should have looked up the time on the web because we had about a 2 hour wait. I can't complain, though. It was warm...I was in a short-sleeved blouse; the lagoon was beautiful; the tide was out; and there were shore birds to watch. A great blues band was playing in the outdoor bar across the street. I told myself that it doesn't get much better than this. 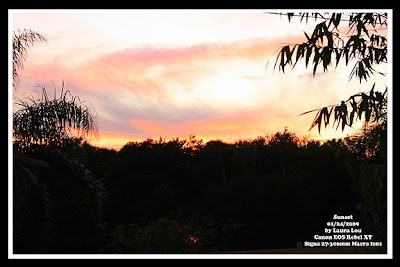 Our neighbor came down with his camera, too, and we waited as it got darker and darker. We noticed clouds around the spot we guessed would be the moonrise. then we THOUGHT we saw a lightening of the clouds. Suddenly there was a sliver of orange below the clouds, which had lightened from the rising moon. The challenge was made greater with the tripod I was trying to use. I bent the legs around the railing of the walkway, and prayed my Canon DSLR didn't fall to the river below...or me, as I squatted down in an uncomfortible position to see through the viewfinder. The tall regular tripod I left down here did not fit the adapter I kept screwed to the bottom of my camera. I thought they were all the same! Now I wonder where the one is that fits the big tripod. I will probably have to check Vivitar online and just buy a new adapter. As we left the pier our neighbor said to look back at the sight and take one more picture. I did and liked it a lot. Once again, as we drove South for the winter, I wondered if we had seen it all or if we would find ANYTHING new. HA! Our neighbor now belongs to an Organic Farm Co-op. He invited us to go and look around Sunday when he put in his time working on the farm. I had a great time taking photos. Yes...something new. The food in the store looked so fresh and good...all grown right there. The Organic Eggs, the Organic Mixed Greens, some of the juices...all looked like great additions to my diet. We need to look into the store a little more. There is a big white Cockatoo that was peering at me through the cage and through the lattice walls of the store. This photo was begging to be taken. As we drove off we could see the co-op farm workers putting in their time weeding and cultivating some of the crops. The farm owners live across the road above the barn. This was one of the nicest farms we have seen down here. The weather was JUST turning nasty as we left the lower part of Michigan at 6:00 AM Tuesday. Had we waited even another hour we might STILL be there. Sleet through parts of Ohio, ice on the car (but not the roads) through the rest of Ohio, heavy rain and fog through the Smokies, and rain into North Carolina to visit family. Yes, not the best drive we have had, but the alternative behind us was storm after storm at home. By the afternoon of Day 2 we were feeling the warmth, seeing sunshine, and celebrating Florida! After stopping for another family visit, we finally arrived Home-South after dark. Our neighbor came over and brought us up to speed on community and neighborhood happenings. By bedtime I felt completely at home. The rate of overgrowth was simply amazing. This was all neat and under control when we left last spring. The jungle between our house and the vacant house next door had a star fruit tree buried in with jasmine and hybiscus. We only had 3 or 4 little fruits before. I looked in among the branches and knew we had a bonanza this year. The fruit just fell into my hands, except for the dozen or so that were already on the ground and fermenting. I had no need for the clippers. Soon I had a box full. We cut up some and enjoyed the pear-like texture with citrus overtones. There is at least that much still ripening on the tree. We gave some away...actually we gave a lot away. The rest we are enjoying SO much. Later, we wandered around to check on the orange tree planted 2 or 3 years ago and the Key lime tree the neighbor gave us as a gift last year. the leaves of both are pretty well chewed up, but the Key Lime gave us a little plate of fruit...for pies, maybe. Meanwhile, we are watching the heavy snow storms back home and we know we got out JUST in time.